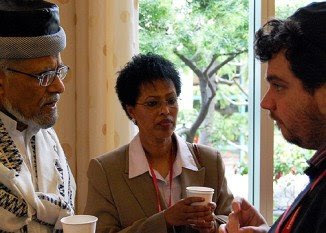 Biblical scholar Ephraim Isaac, left, chats with Nigist Mengesha, director of Israel's Ethiopian National Project, and Conservative rabbinical student Juan Mejia at the Be’chol Lashon conference in San Francisco. SAN FRANCISCO (JTA) -- Miguel Segura Aguilo’s ancestors were executed as Jews five centuries ago in Spain, but he is not welcome in his local synagogue today. Gershom Sizomu, who will be ordained this month in Los Angeles as a Conservative rabbi, dreams of setting up the first yeshiva for African Jews in his Abayudayan village in East Uganda. Rabbi Capers Funnye, spiritual leader of a largely African-American congregation in Chicago, is off to Nigeria to make connections with the Ibo, a community that claims Jewish heritage. These men, and dozens of other representatives of far-flung communities seeking recognition by the Jewish mainstream, gathered earlier this month in San Francisco at a conference sponsored by Be’chol Lashon (In Every Tongue), a project of the Institute for Jewish and Community Research. The Ibo, Lemba and Abayudaya of Africa, the anusim and xuetas of Spain and Latin America, Ethiopian Jews from Israel, Indian Jews from New York and Asian-American Jews-by-Choice spent three days networking and sharing information about their struggles to join the global Jewish family, a family that is not always eager to embrace them. “The Jewish community keeps talking about the crisis of intermarriage and the crisis of declining numbers, but meanwhile you’ve got people with Jewish heritage, spiritual seekers, Jewish communities of historical significance, and the Jewish community is doing nothing to help them,” says Gary Tobin, the institute’s president and a longtime advocate of greater openness to those outside the Ashkenazi mainstream. According to institute research, at least 20 percent of American Jews are racially and ethnically diverse. But old stereotypes about what “real Jews” look like persist, Tobin says. Some of these communities have gone through formal conversion, like the 800 Abayudaya of Uganda, who did so together in 2002. Others have not, including the Lemba of South Africa, who claim Jewish ancestry and point to the Jewish cultural practices they have maintained for centuries. Still others languish in a gray zone, notably the anusim of Spain, Portugal and Latin America, known more popularly as the conversos -- those whose ancestors were forcibly converted to Catholicism under the Inquisition, and who now wish to reclaim their Jewish identities. Estimates of their number range from tens of thousands to more than 1 million. Aguilo was part of a group from Mallorca, Spain that met with Israel’s Ashkenazi chief rabbi, Yonah Metzger, last year, to request a mechanism for their return to the Jewish fold. “He told us, ‘I need to find a legal tool to defend your position to the rabbinate,’” says Aguilo, a prominent journalist who writes and lectures widely about the xuetas, descendants of those conversos who recanted and reclaimed their Judaism before execution. Aguilo and his friends are still waiting for Metzger’s reply. “Whatever happens, just don’t put a cross on my grave,” he says, only half-joking. Some of the anusim claim special status as the descendants of Jews, insisting that they don’t need formal conversion. A handful of sympathetic rabbis have held “ceremonies of return” for them, just as a growing number of Conservative rabbis describe the conversion of people with one Jewish parent as “affirmations” of a Jewish identity they were born with. But thousands of others are willing to undergo conversion, says Cuban-born Rabbi Manny Vinas, who runs El Centro de Estudios Judios, a Spanish-language Torah center in New York that tries to guide anusim back to Judaism. “These people want to return to Jerusalem with their heads held high,” he says, arguing the need for a formal process to help them. Those who wish their conversions to be recognized by Israel are thwarted, he asserts, by new conversion regulations worked out between Israel’s rabbinate and the Orthodox Rabbinical Council of America, whereby only conversions performed by 15 Orthodox rabbinical courts in North America will be accepted in Israel. That means, he continues, that anyone from Central or South America who wants to convert must travel to North America, a practice that favors the rich. “The only people able to convert are those with enough money to do it in the United States," he says. Some of the communities in Be’chol Lashon’s network are far removed from this political struggle over conversion. The Lemba of South Africa, who formed their own Lemba Cultural Association in 1948, are still at the stage of finding out who they are, and what Judaism is all about. Be’chol Lashon is sponsoring a Lemba student in Botswana who is writing his doctoral dissertation on the history of the community. This is in line with the group’s focus on empowering local leadership, says Be'chol Lashon director Diane Tobin. She noted that Be’chol Lashon also funded Sizomu’s five years at the Ziegler School of Rabbinic Studies in Los Angeles, so he could return to Uganda this summer as Africa’s first native-born black rabbi. Sizomu wonders what effect his return will have on his people's worship style, as he has now become accustomed to western Conservative norms. "The words we use are the same," he says, explaining that the Abayudaya use prayer books donated by Conservative rabbis who have visited this past decade, "but the melodies are African." Tobin said she hopes to fund rabbinical studies for more African Jews. “We will work with anyone who wants to move forward toward being part of the Jewish community,” she says.